The Magician is a card of the Major Arcana set and is usually positive when drawn. The first step on the ‘Journey of The Fool’, The Magician represents the first steps on a new path and a glimpse into the bigger picture. The symbolism in the Rider Waite deck hints heavily on Hermeticism, as described later. The Magician symbolises potentiality, concentration and becoming more than yourself, as well as glimpsing into the structure and mechanics of the bigger picture. “As Above, so below”. Past – The Magician in the past position shows you have achieved something in the past, whether you feel the achievement or not doesn’t matter, but you are still benefiting from it. The past is the best predictor of the future, are you have set yourself up well through a possible number of means; good grades, good relationships, or good experience. Present – The Magician in the present position represents your ambition and confidence. You might have just started a project or a new job. You may have new ways to help people, through either learning from your elders, or helping those that you can. Consider this transfer of knowledge. Future – The Magician in the future position represents your potential. As said above, The Magician is a good card to draw. Maintain your vision and see it through. Don’t get distracted by side projects, and don’t think you know everything just because you’ve started. Work / Education – The Magician in regards to Work means that you’ve started a new job, are looking for a new job, or a new path will present itself in your current job. Things can only get better. This is especially good if to draw if you are wish to transfer from a long period of unemployment. Romance – The Magician in regards to romance means that you might find somebody new. Meet new people, now is the time. Friends – Much like The Fool, The Magician means branching out into new groups. The positive energy of the Magician knows no bounds. You might meet lots of new interest people through a new hobby or interest. Money – The Magician brings wealth and the drive to create wealth. There are more important things, but a money making opportunity will present itself. It might be unexpected, like a craft you didn’t realise would be profitable or some sort of creative endeavour. Health – Don’t worry about your health, but look for ways to eat better and exercise more. Maybe join a gym or workout group or go for more regular walks. Try a new exercise activity. In all aspects of your life, look to group up with others who are better than you, and help those whom you are better than. Spirituality and Mentality – The Magician, as you’d expect, is tied to spirituality. Now is a good time to look into systems of religion or beliefs that interest you. Are there any Yoga or meditation groups near you? They might be worth checking out if you’re interested in those. Meeting new people interested in these things is important. The Rider-Waite tarot deck beautifully illustrates the Magician in regards to ‘The Fools Journey’. 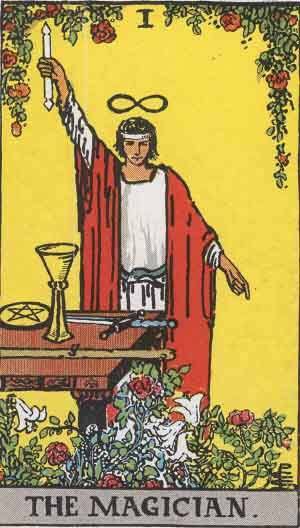 The Magician is surrounded by the symbols of the Tarot and holds high to heaven a Wand, while pointing downwards. This is a representation of ‘As Above, so Below’, a mantra in Hermetic thought. As an observer, you are always in the middle. The Magician realises this as a core foundation of the universe. There are always greater and lesser, better and worse, microcosm and macrocosm. You achieve and reach for new heights, you fail and there are new lows. You can always keep achieving, or always keep failing. The Magician in reverse can suggest that something is seriously wrong with the nature of your universe. You will need to make changes as soon as you can. The flow of above to below has been interrupted, through external influences that are causing illusions. Think about your life and the problems you are facing. Do you have the means to solve your own problems right now? We’ve selected live tarot readers to give you a FREE 3 Minute interpretation of The Magician! Scroll through them below and pick your favorite one.